When it comes to choosing the perfect leavers hoodies for your school, there are lots of great options to consider. 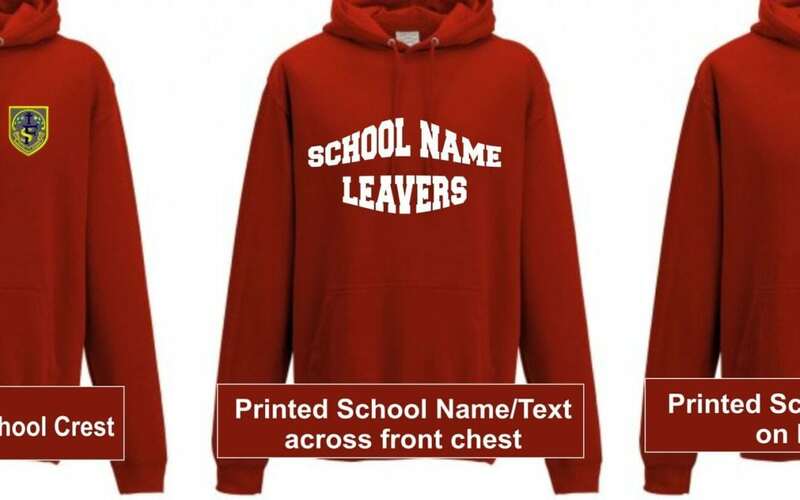 From personalising using print (and what exactly to print onto the hoodies) to personalising using two-toned hoody colours or embroidery, there are options to suit every school’s colours or every individual leaver, depending on how you would like your school’s leavers hoodies to be personalised. Firstly, you will need to decide whether the hoodies that are being made available for your school leavers are organised by the school or not. If they are, it is often easier to order one colour (usually your school’s colours) and style, but you may also want to let leavers choose the colour of their own individual hoody. Once you have decided how many options you’re going to provide to students, that forms the basis of the type of hoodies to order. If this is something that you are going to decide for yourself, then there are lots of colour options to choose from. Many schools choose to use their signature main colour as the colour of their hoody and then any secondary colours are highlighted using print and embroidery detail. In other cases, schools will choose their main colour and then have white or black as the print colour, as this often shows up and provides a smart look. There are also options for two-toned hoodies, where you can highlight a second school colour by having a different colour used in the inside of the hoodies’ hoods and as a feature colour used in the zip. For example, see our kids’ two-toned zip hoody. There are various different ways to personalise what is displayed on leavers hoodies. Both print and embroidery details are the best ways to create a long-lasting design for your school’s leavers hoodies so that students will be happy with their hoodies for years to come. We are able to print on any side of your school’s leavers hoodies. Some schools choose to personalise theirs with just a student’s name and the year that they are leaving the school; others have the names of classmates incorporated into the relevant year’s number e.g. ’18 for 2018 and, in some cases, schools will choose to further personalise their hoodies by having printed names along the sleeves, too. More often than not, the personalisation is completed with by embroidering the school’s emblem or logo onto the front of the hoody. Embroidery can also be used to personalise hoodies in other ways. Once you have decided what design you would like to see on your school’s leavers hoodies, you’re ready to make an order!